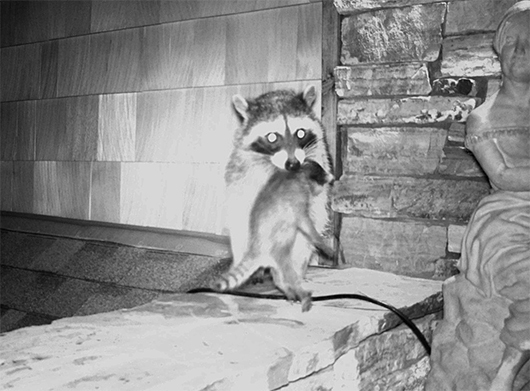 Today, we went to work on a home in Pacific Grove, shoring up all the vents except for one so the mother raccoon inside could still come and go. The next step would be to apply a repellent barrier with a certain mix of essential oils to encourage her to move her babies to another location. Sometimes we install an electronic device in the crawlspace to add pressure. Well, today, we didn't need to do any of that. The mother raccoon was so upset by us working around the exterior of her "den", that she decided to move one of her babies while we were on site.